The Email tab allows you to determine how you want emails coming in and out of Broker Brain to function. 1. From the Admin tab, click the Site Settings sub tab on the left-hand side of the screen. Click the Email sub tab (at right). Enable Inbound Email - When you initially add a user into the system (this is covered in Users), you will provide their private email address. If you elect to enable inbound email, the system will also assign them a Broker Brain email address. Once this feature is enabled, any emails you send from the Notes section of a property will show as coming from your Broker Brain email address, and any replies to that email will come back into Broker Brain and be filed in the Properties>Notes section from where the intial message originated. 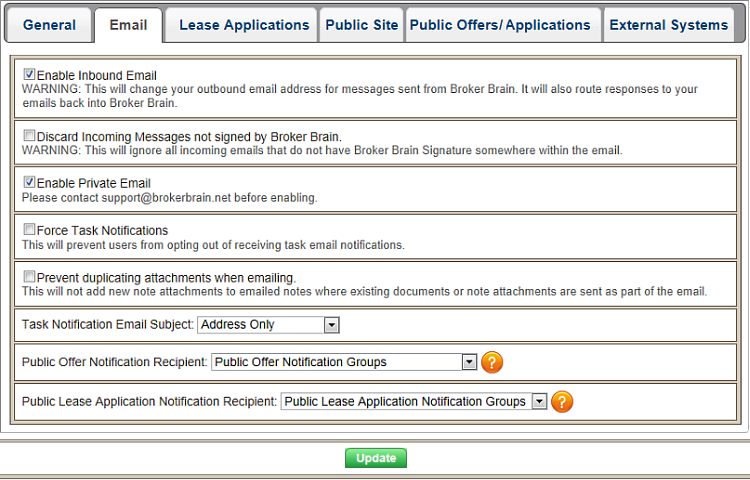 Discard Incoming Messages not signed by Broker Brain - When this feature is enabled, any emails sent directly to your Broker Brain email address from a private address will not be received. Emails would only be received if they were sent as a response to an email you sent from within Broker Brain. Enable Private Email - If you wish to route your email messages through your own server, select this option. Contact us at support@brokerbrain.net to set this up. Force Task Notifications - By selecting this option, users are prevented from disabling their task email notifications. Prevent duplicating attachments when emailing - Enabling this feature prevents duplicate attachments from being sent in a message if that attachment already exists in the email. Public Offer Notification Recipient - This feature allows you the option to control who receives public offer notifications. By default, notifications will forward to Public Offer Notification Groups, but you can elect to direct this information to each property's Assigned Agent, Assigned Transaction Coordinator, or to both the Agent and the Coordinator. Note that if a property does not have an Assigned Agent or Transaction Coordinator, the Public Offer Notification group will receive this information. Public Lease Application Notification Recipient - This field allows you to indicate who will receive email notifications when a public lease application is submitted. By default, notifications will forward to Public Lease Application Notification Groups, but you can elect to direct this information to each property's Assigned Agent, Assigned Transaction Coordinator, or to both the Agent and the Coordinator. Note that if an Agent or Transaction Coordinator is not assigned to the Property, the email will be sent to the Public Lease Application Notification group. 1. First, select a unique email address for one particular user. It is HIGHLY recommended that this email address is unique and you are not attempting to share it between Broker Brain and your email client. For example: if your email address is myname@mycompany.com and you share this address with Broker Brain, every email that comes to this address would go to Broker Brain as well. We don't recommend this configuration as it generates extra bandwidth usage for you (sending a copy of all of your emails to Broker Brain) as well as generating extra bandwidth usage for us (having to receive a copy of all of your emails). Our recommendation is to select a new email address that is dedicated for incoming and outgoing emails within Broker Brain only. 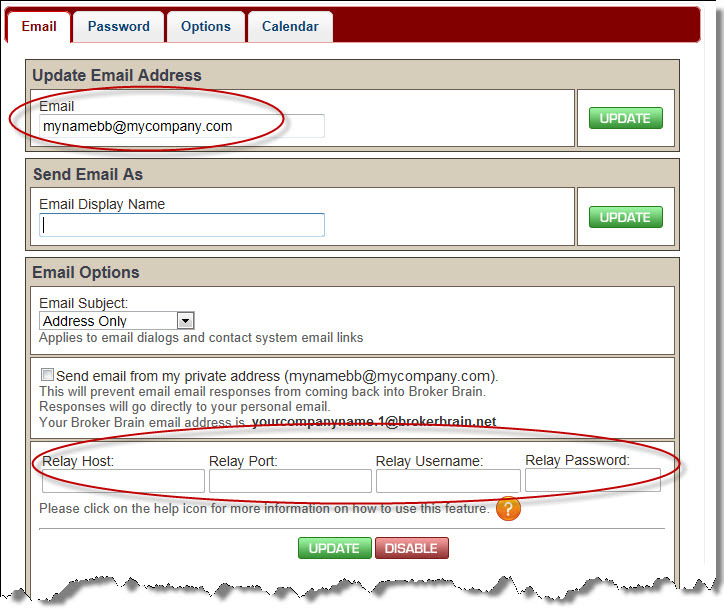 A good example of a unique email address is: mynamebb@mycompany.com. 2. Contact your email administrator and have the above email account created in your domain. 4. 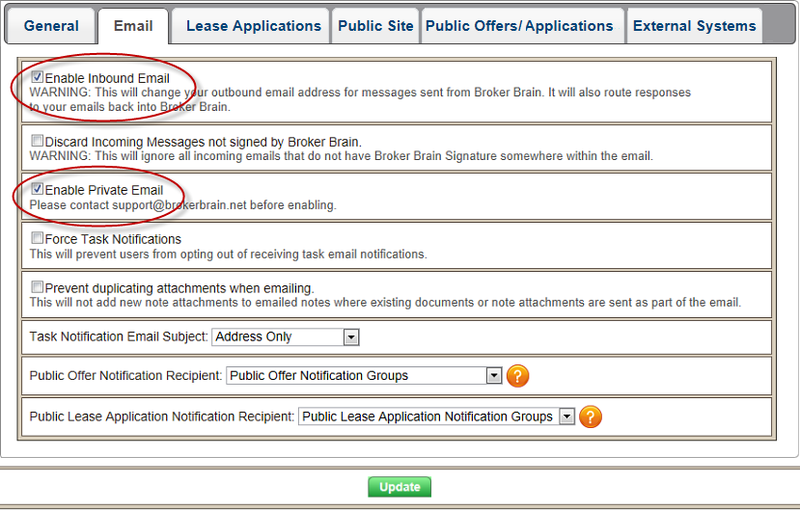 Next, enable the advanced email feature within Broker Brain. This is done from Admin > Site Settings > Email. On the Email tab, check both Enable Inbound Email and Enable Private Email, (as shown in the screen shot below), then click the Submit button at the bottom of the screen. 5. Go to the My Account tab, and on the Email sub tab, enter the new email address into the Update Email Address field as shown in the screen shot below. Click the Update button at right to save your entry. 6. Also under My Account, you will need to setup your Relay Host, Relay Port, Relay Username and Relay Password (also shown below). This information can be provided by your email administrator. Make sure NONE of your Inbound Message Notifications are directed at this new address (mynamebb@mycompany.com) as this will cause an email loop.